Eight is the number of Strength in the Tarot and The Four Suits must now find a way to access their own particular Strength if they wish to make real progress on their Journey. The Four Suits show the different approaches to finding or accessing Strength. The Wands stand for the Strength experienced when their energy is allowed to flow freely, the Cups find the Strength to leave an emotionally un-fulfilling situation in search of personal happiness, the Swords struggle to find the psychological Strength to liberate themselves from limiting, negative and restrictive mindsets and attitudes while the Pentacles showcase their Strength of commitment and determination. The Four Suits have certainly been through their ups and downs and each came up against their most recent challenges either internally or externally in the Seven. Now, they must all access their personal Inner-Strength to move them past any obstacles and set-backs experienced in the Seven. In the Eight, The Four Suits experience a sudden release of their Elemental Energy. For some, it will feel like they have the wind in their sails, as life begins to speed up with activity and the much longed for positive change. For others, the sudden release of their Elemental Energy may feel more overwhelming than anything else. One thing is for certain, the Four Suits will really have their eyes opened to the sheer force and Strength of their Governing Element once released from its shackles. For the Wands, the sudden release of their Elemental Fire Energy explodes into their life and brings with it excitement, activity, fast movement and rapid change. For the Wands to be caged in, as they were in the Seven, the arrival of the Eight and the Freedom it brings couldn’t come a minute too soon. They do not feel any fear of their Element but rather want to jump right on board and experience the thrill of the ride. Their life has certainly livened up once more and in the Eight, we will experience them at their very best, for this will be the highlight of their journey, and how they would like all days to be. 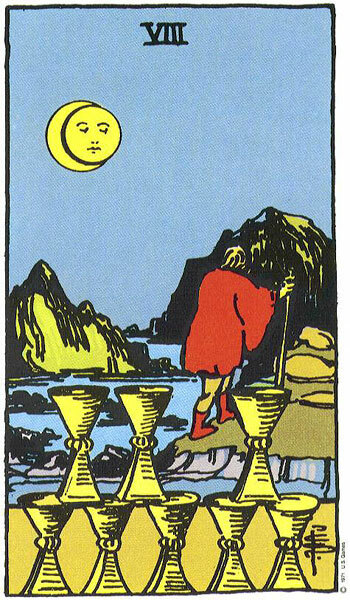 A healthy, balance of Water being released to the Cups, provides enough of a strong current to carry them forward and out of the stagnant and murky water of the Seven. Once in this current of their own Element, they will allow and trust it to deliver them to where they are meant to be. For the often slow-moving Cups, this sudden movement and change may initially fill them with fear of the unknown. Regardless of how anxious they might feel, the Water only flows one-way now. Therefore they must commit to moving forward until they find what they are looking for. They have identified the need for change in their life and so the Universe has sent their own Element, in gushing strength, to rescue them from their emotionally un-fulfilling environment or life. The sheer force of the Air Element being released on the Swords will be very hard to control. 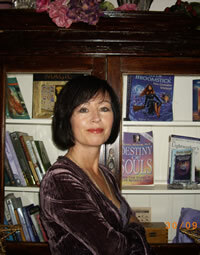 The Swords badly need to be freed from all their accumulated stress, tension and conflict. They have made attempts in the past to escape it, but even though they badly need to catch up with the other Suits to experience the thrill and amazing strength of their Governing Element, they still seem to have a heavy horse dragging behind them. They need to change and make rapid progress with the rest, but their Sword can cut two ways. In the Eight, the Strength of their Element Air can empower their Sword to slice and sever anything that binds them to negativity and a dysfunctional mind. Like a machete, it will clear a pathway through the dense undergrowth of their mind and allow them to see daylight and taste the potential of freedom. That is, of course reliant on the Sword being handled correctly. If not, the Force of Air can turn the extra-strenghtened Sword on its handler, causing further damage and destruction. The Swords then multiply and surround their owner. It is a difficult one to call, but depending on the individual, the Eight can herald the dawn of a new era and understanding or the death knell of a struggling and rapidly breaking down mind. For the Swords, it is really make or break time for them in the Eight if they stand any chance coming out of this in once piece. All the stress and torment must stop here, but are they strong enough to handle their Element? As we all know at this stage, The Swords can be their own worst enemy. 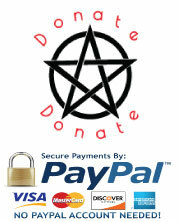 The Force of The Earth Element being released on the Pentacles is what they have been waiting for, for a long time. The stabilising, grounding and rock-steady strength of Earth appears like a landslide and dumps its load right at their feet. This is what the Pentacles want for they can build with and on Earth thereby strengthening their position. They can now throw themselves wholeheartedly into their journey for they know that they have enough Earth to go the distance and are confident they will have much show when they cross the finish line in the Ten. 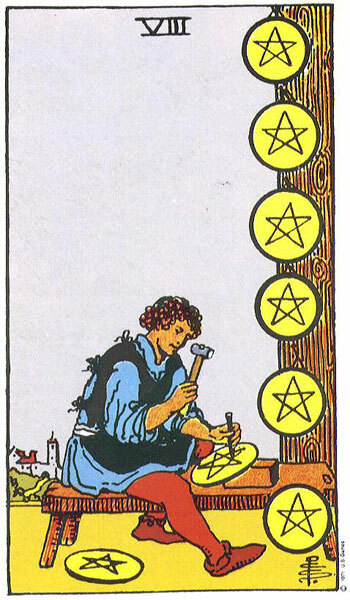 The Eight empowers the Pentacles because the number Eight is also a magical number for business, trade and commerce. With the Eight Energy supporting them, they can feel the success within. Now they just want to be allowed to get on with becoming the Masters and Experts of their Field of Earth. Hard work but happy days. In the Eight, the Four Suits shift into a higher gear and movement speeds up for most, if not for all (Those poor Swords). The Eights bring a buzz of excitement and activity in their wake and a sense of real progress being made. Things are beginning to happen and everyone seems to be mobilising once more with a building sense of anticipation as they move ever closer to the finish line. The Eight’s mission is to free them from their limiting circumstances so that they can be what they want to be. A number must be very strong to do that. The Eight has it all. The number Eight also symbolises solidity of foundations, firm balance and harmony and as mentioned above, Eight is a very lucky number in business and all financial dealings. In The Major Arcana, The Four Eights correspond very appropriately with Strength (VIII). Strength speaks for itself and is there to remind us that no matter how hard the struggle, how difficult the journey, how high the obstacle, how painful the feeling, we all have an Inner-Strength that can be called upon to bring us through life’s ordeals. It is our natural survival instinct and when our Inner-Strength is put to the test, it can move mountains, walk through raging fire, swim in shark infested waters, battle against terminal cancer and stand up to intimidation and injustice . It is fearless in the face all known terror. It props us up and helps us to come out fighting each day, refusing to let us give up or give in. Strength is deaf to the cries of ‘I can’t’ or ‘ I am not able’ , ‘I won’t’ or ‘I am afraid’ for it only speaks in positives. Each of The Four Suits accesses Strength in their own way to overcome the challenges that come their way. The biggest challenge they most often encounter is the challenge from within, when they begin to lose heart, their self-confidence and self-belief. The Star in The Major Arcana, Card XVII 1+7=8 also corresponds with The Four Eights and Strength promising balance and harmony to The Four Suits should they find the Strength to overcome their obstacles or fear. The Star has survived the Onslaught of the Tower, the greatest challenge of all, by calling on her Inner-Strength during her darkest hours. Her reward is true peace and the freedom to be who she wants to be. The Four Suits can find likewise should they decide to following her advice. A single Eight in a Reading can highlight an area of your life where you are beginning to overcome personal issues, challenge or difficulty. It can also suggest an area of your life that you are making progress in or mastering. The situation involved is bound to have been more long-term than short-term as the Eight brings results after hard effort. If the Single Eight in a Reading is the Eight of Swords, then there is bound to be a lack of harmony or stability for the Querant. 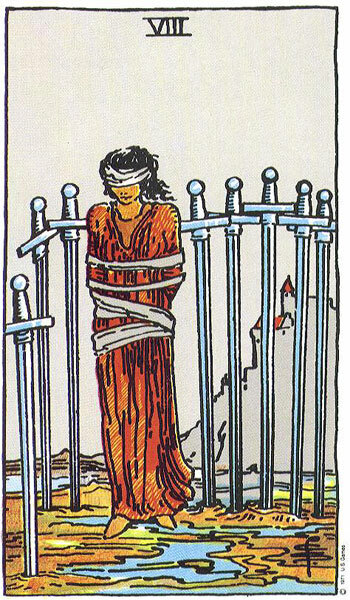 In fact this single Card can be influencing every aspect of their life. Sort this out and the rest will miraculously fall into place. The Upright Eight of Swords will bring a mighty challenge to overcome but it can be done if enough effort is applied. Several Eights appearing in a Spread can suggest that your Inner-Strength is being tested but that you have sufficient ability or power to deal with the situation. However the Eights do have a very positive effect on a Reading and can suggest that there is much activity and excitement for the Querant. The more Eights in a Reading the busier life gets, not with boring or tedious things but rather a sense of positive things beginning to happen all round. Several Eights can herald the end of a stagnant time in life by rushing in powerful energy to stir things up. An abundance of Eights will bring travel, positive change, a whirlwind of social activity and productivity at work. Life will certainly be worth looking forward to and very interesting. Great progress can be made with several Eights. When a Single Eight appears Reversed in a Reading it can suggest an area of your life that is certainly dragging you down. Reversed Eights return you to the challenges and set-backs of the Seven because they have not been properly dealt with. It can suggest a lack of courage and faith in one-self to face up to problems. The Querant can become stuck, making very little effort to free themselves. The appearance of a Reversed Eight of Swords can have again cut both ways. Either the Sword is used to sever the bonds that tie or the Sword is plunged in to the heart. Freedom or Dysfunctional Psychological Enslavement. Several Reversed Eights can highlight an even worse scenario then the One Eight appearing. There is bound to be a very noticeable sign of lack of Inner-Strength or courage coupled with a sense of doom and failure. Weakness of spirit and confidence can cause terrible negativity. Several Eights appearing can also be a sign that nothing much is happening in life at present or that the Querant is finding it hard to get anything off the ground. The Social Diary is bound to be empty and there may be a sense of boredom. Nothing exciting is happening except the same old, same old. Energy levels may be low with a lack of motivation . 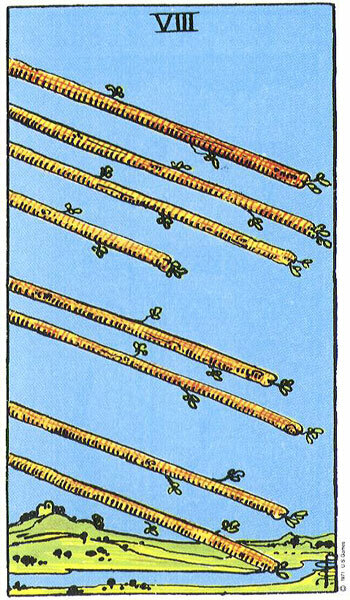 Now Click onto The Eight (VII) of Wands, The Eight (VII) of Cups, The Eight (VII) of Swords and The Eight (VII) of Pentacles or in the Sub Menu where you will find their Descriptions, Meanings both Upright and Reversed along with all their relevant Keywords. Alternatively click on the Images above. Thank you for your great teachings, they are so valuable.